Imagine that you’ve invited someone over for a meal that you’ve lovingly planned and prepared, and they arrive, look around and say, “Oh, thanks so much, that’s very kind of you to do all of this, but I don’t have much of an appetite, actually”. For me, as a cook, I can’t think of anything that would feel more like all of the air’s been let out of my balloon. The idea that I’ve gone through the careful consideration to create something specifically for another to take pleasure in, only to find that it won’t be realized or fulfilled, is heartbreaking. I was sort of contemplating this recently when I was considering some of the emotions that I myself experience when I prepare a spread for other people to enjoy. My genuine desire is for their experience with the meal to be a pleasurable one. My aim is to have all of the food be delicious and flavorful, pairing dishes in a way that makes sense in regards to the meal as a whole. I want my guests to taste the love and care poured into the meal so that the intention with which I prepared it demonstrates that they are worth so very much to me. After thinking about this for a moment, something interesting occurred to me: I had the realization that a guest’s very willingness to accept my gift of a specially prepared meal, made just for them, actually becomes a gift to me, as well. My guest has joy in receiving, and I in turn experience the pleasure of participating in and observing their joy, bringing everything full circle. I was grateful for the realization, because it prompted me to then ask myself, “What kind of guest am I?” It was in this moment of awareness of my own desires that I realized the importance of pondering what it means to be a gracious “guest”, at this table of life, when someone else is the “host”. As I get older, and hopefully wiser, I’m recognizing that using my own life’s experiences as a source for a richer empathy for others is a big thing, as it’s how fundamental understanding between people can be achieved. I want to consciously continue to grow in the direction of becoming a person who is more aware of graciously receiving what has been so carefully and lovingly prepared for me in my life, so that I can always arrive on-scene hungry and ready to be filled with the bounty that awaits me there on that table. My hope is to be able to take the awareness I have of my own desire to please and share, and use it to remind myself that if I long for that, why wouldn’t someone else? Just as I hope for a vessel to come along that wants to be filled with the “food” that I have to offer, may I also be that vessel for another to take joy in bestowing upon. Then, no one is left unfulfilled—we all can give, and we all can receive. Food has inspired me, once again, as it always does. It may be a bit silly to imagine a chicken breast being ready and willing to be stuffed with all sorts of beautiful and delicious morsels, but I can’t help but see a parallel. Not only do I want to continue to be an enthusiastic host, filling others with what I have to offer them, but to be a gracious and eager guest, accepting the invitation to another’s banquet table, and arriving hungry, ready to be filled with what they long to bestow upon me. 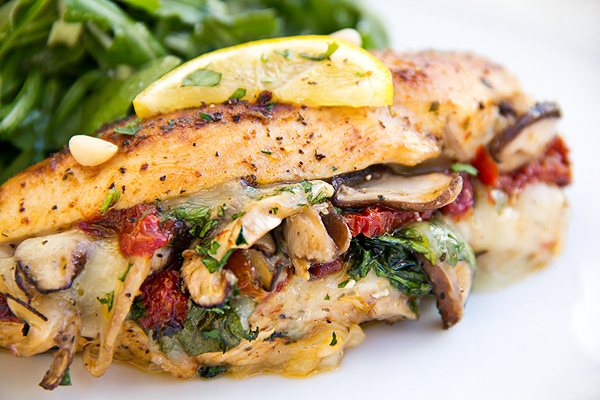 -On a large plate or platter, marinate the chicken breast by adding 1 tablespoon of the olive oil, the lemon zest and juice, the Italian seasoning, the ¼ teaspoon of the salt, the ¼ teaspoon of the black pepper, the garlic powder and the paprika; allow to marinate for about 20 minutes while the mushrooms are sautéed, and the salad ingredients are prepped. -After marinating the chicken breasts, heat a grill pan on medium-high heat; once very hot, add the drizzle of olive oil, and add the marinated chicken breasts to the grill pan; cook the chicken breasts for only 3 minutes per side, or until golden brown on the outside; you DO NOT want to cook the chicken all the way through, only to grill the outside, as it will finish cooking in the oven. -Remove the chicken from the grill pan, and once cool enough to handle, make a large slit into the thickest part of the breast to create a deep pocket; be careful not to slice all the way through the breast cutting it in half, but just enough to make a large pocket to stuff; next, begin to stuff each breast with a slice of the Provolone cheese, a few leaves of the baby spinach, a spoon of the sundried tomatoes, a spoon of the sautéed shitake mushrooms and a pinch of the chopped parsley; secure each breast by using 2 toothpicks to hold the breast closed, and place each stuffed breast onto the foil lined baking sheet and into the oven to bake for about 8-10 minutes, until the chicken is cooked through and the cheese is melted; remove from oven, and remove the toothpicks; keep warm until ready to serve. 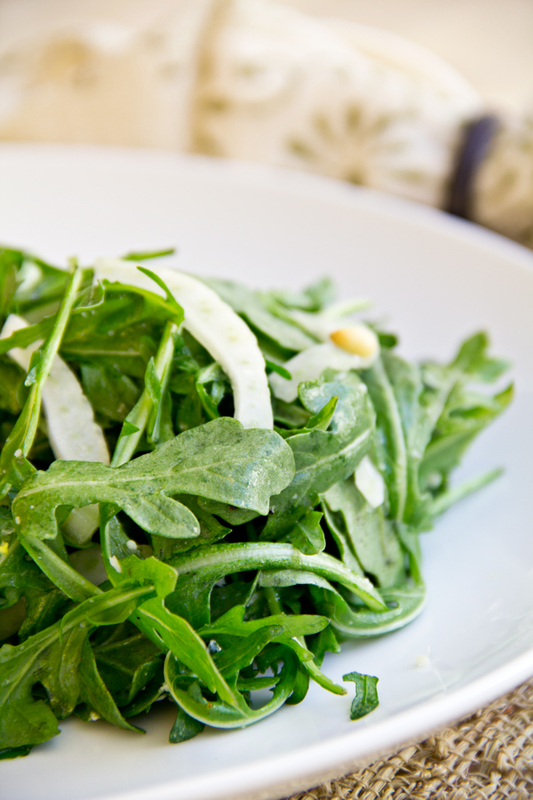 -In a medium bowl, add the Arugula and the sliced Fennel, and toss together; hold in the fridge while you make the dressing. -In a small bow, add the lemon juice through the garlic, and lightly whisk to combine; next, slowly begin drizzling in the olive oil, whisking all the while until the dressing is well emulsified; set aside until ready to dress the greens. -Once ready to serve the salad with the Stuffed Chicken, drizzle the dressing over the Arugula greens and Fennel, and toss well to coat; serve with the Stuffed Chicken. 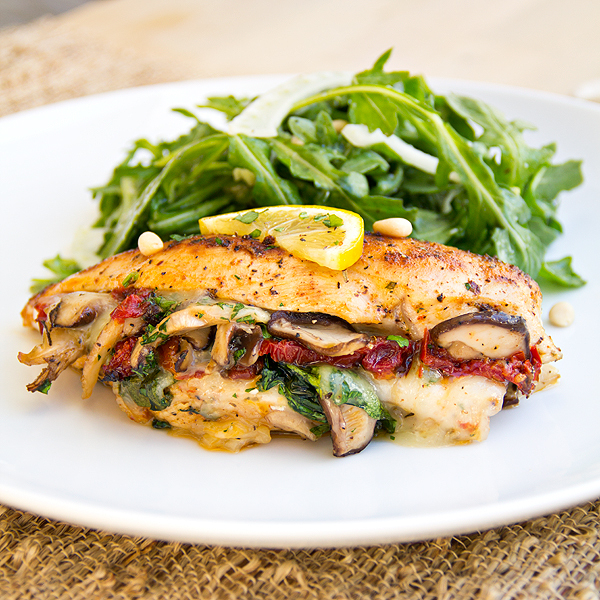 -Place one Stuffed Chicken Breast onto each plate, along with a generous portion of the Fennel and Arugula Greens on the side; add a lemon slice, a sprinkle of the pine nuts and a sprinkle of the chopped parsley on top of each chicken breast, for garnish. That’s both a summer dish and confort food, so lovely stuffed chicken. Have a lovely Day and Thanks for the inspiration! Yes, you got my intention with this dish — summer comfort. Enjoy your weekend! Hope all’s well in Barcelona, Villy! Beautiful photo, even more beautiful musings. Wow, that looks great and not too hard 🙂 Excited to try it. Thanks!! I just found your blog through foodgawker. You have so many great recipes on here and your photography is fabulous! Made this last night for dinner! Absolutely delicious! I’ve made every recipe you’ve posted (my other half thanks you because of it). This is one of my favorites! Thanks, Logan! I’m so glad you both enjoyed it, and by the way, can I say “WOW”? You’ve made every recipe I’ve posted? I can’t begin to tell you how cool I think that is. You and folks like you are why I recipe develop and write in the first place; to have you come back to share that with me, means the world. Thank YOU, and I hope you continue to come back and enjoy the recipes. Very impressive looking meal!!! Well done!!! I made this dish today…..it was really good! 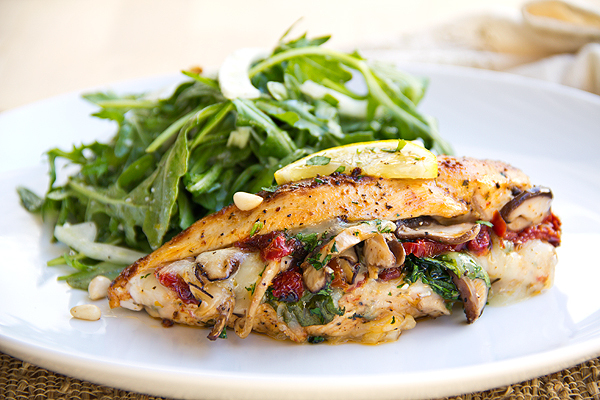 I loved the sun dried tomatoes in this dish…it added such great sweetness to the savory chicken. It was great. Thank you! So glad you got that little note of “sweetness” from the sun-dried tomatoes; they’re really nice to use when fresh tomatoes would be a little too juicy for a particular dish. Glad you enjoyed this! Looks delish, doing it tonight! would it be okay to marinate the chicken even longer? Hi Jody! Yes, if you have the time, marinate the chicken longer! (Longer is always better.) I hope you have fun preparing this recipe tonight, and thanks for stopping by! Did you bake it uncovered? And can i use glass dish instead of a foil covered pan? Hi Fiffy, yes—I baked these uncovered. And you can certainly use a glass dish instead of a pan; however, I would line it with some parchment or foil for easier cleanup. Hope you enjoy! Can the stuffed chicken breast be frozen? Hi Jeanie, since I’ve never tried this, the honest answer is that I’m not sure; but I don’t see why you couldn’t do this- just allow the stuffed breasts to defrost in the fridge (until thoroughly defrosted) for a couple days before finishing in the oven. Hope you enjoy! Amazingly moist, delicious and satisfying…I substituted herbs de Provence for Italian seasoning (thought I did but I didn’t have any). After creating a pocket, I decided to put everything together (sautéed mushrooms & garlic, baby spinach, sundried tomatoes and chopped it up. After inserting the bed of provolone , the chopped mixture went on topic was delicious!! Hi Kathy, so glad you enjoyed! Herbs de Provence are actually a wonderful sub-in for the Italian seasoning, so you did well there. I appreciate you coming back to share your experience!